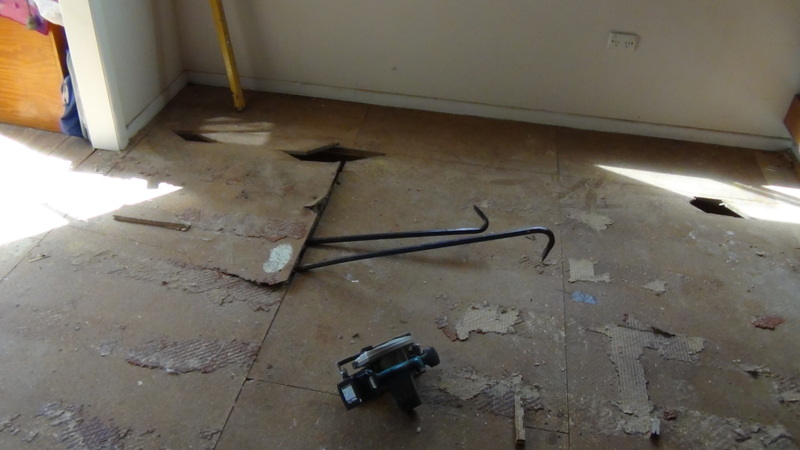 We were asked by the client who is a friend of mine to inspect their floor as it creaked and squeaked and seemed to have dips and rises. 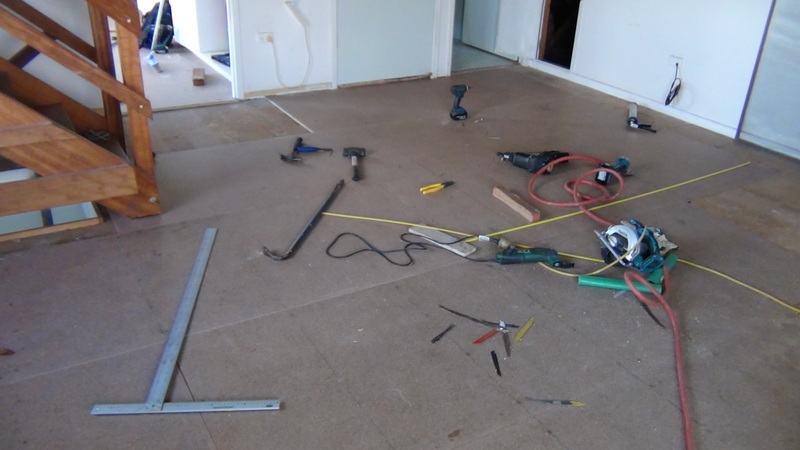 We had to remove the carpet and underlay. 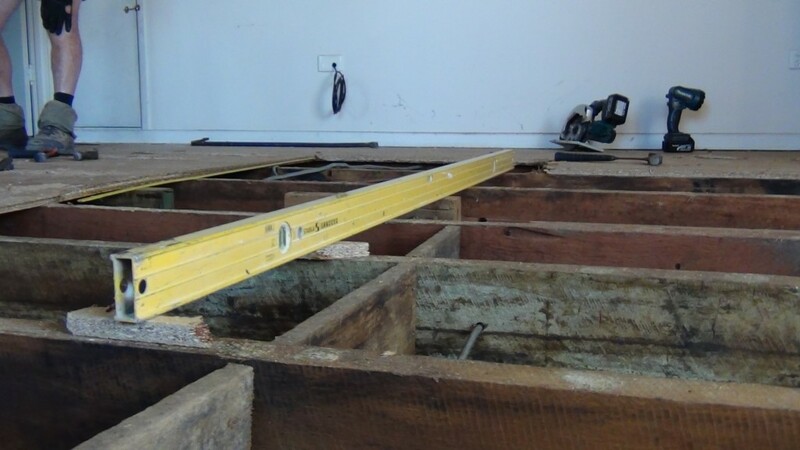 Upon removal we could clearly see that the floor was not level and the only way to fix it was to lift up the floor and inspect the joists. What we saw raised a few hairs and me being bold, it’s hard to do in the best of times. 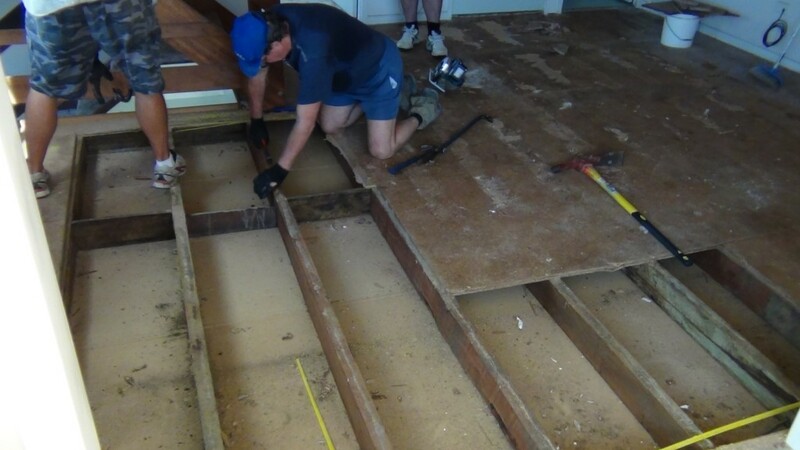 We had to pull up the old chipboard floor with pinch bars. I must say it was a bit of a task getting it up. Tip. 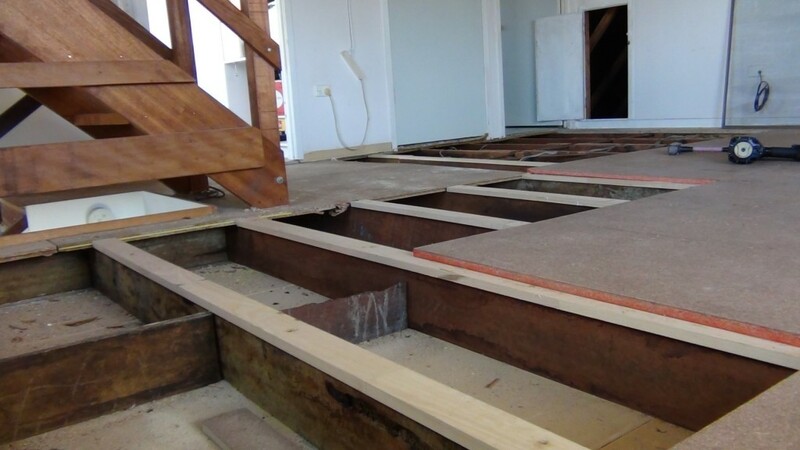 When pulling up flooring or decking cut it into along the direction of the joists so to that you minimise the resistance in surface area. 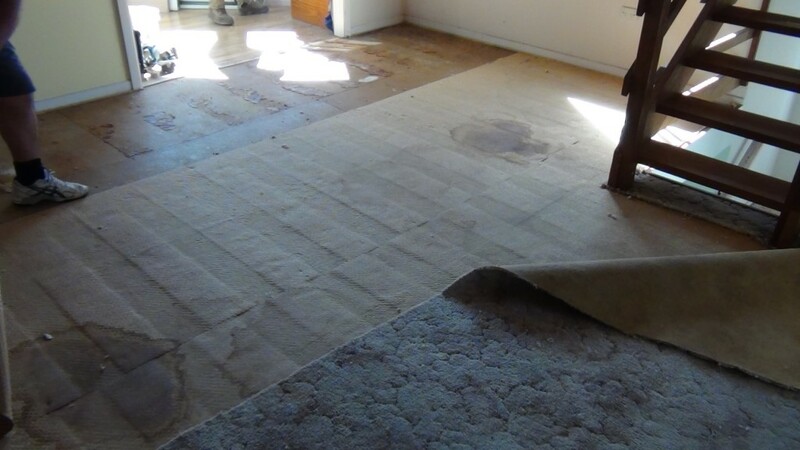 What I mean by that is that you can easily pull up small areas of floor apposed to larger areas. The only thing is that you can’t reuse the material so you need to weigh up the cost of time apposed to material and ecstatic outcome. A VERY IMPORTANT TIP ! Always adjust your saw blade depth to cut the thickness of the floor only. I can’t stress this hard enough. The photos below will show you what we uncovered. You will see on the photo above that the carpentry was bad. There are no transfer blocks under the wall frames. Your load bearing pressure has put a sag in the floor and as a result the doors started to jamb up. I have repaired too many jobs like this over the years. It’s disappointing to see that some tradespeople don’t take pride in their own work or they just don’t know. As far as for the electrical uncovering we turned of all the power once we realised what the workmanship was like and exposed our work area. We also called a licensed electrician to rectify the mess to a point. We wrote on the floor boards once they were nailed of the hazard below as well. 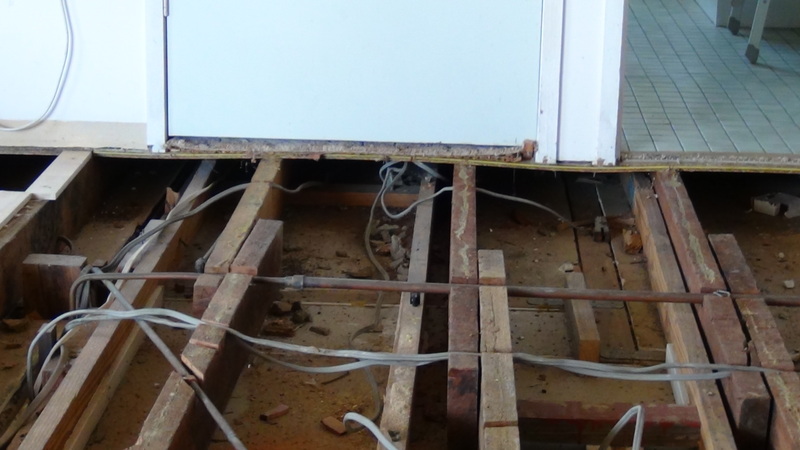 Once the sparky (electrician) left we looked at the levels in the floor. 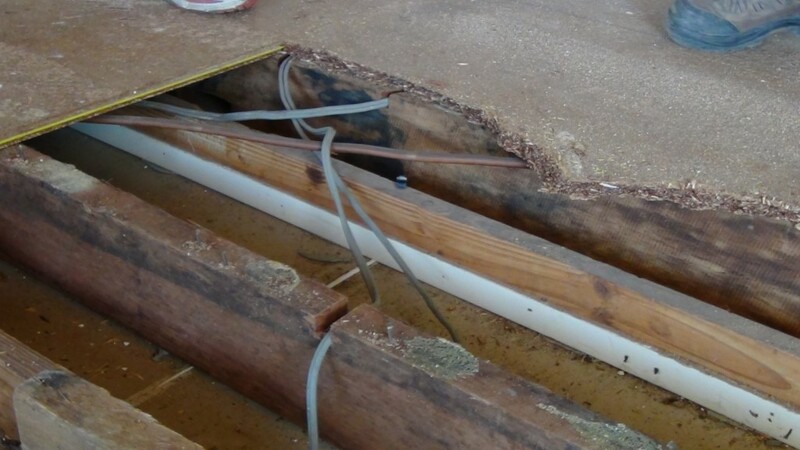 In the past there was a renovation an add on, and the builder at the time didn’t get the floor levels right so there was a bow in the floor and over time the nails lost their grip and hence the squeaks and other. 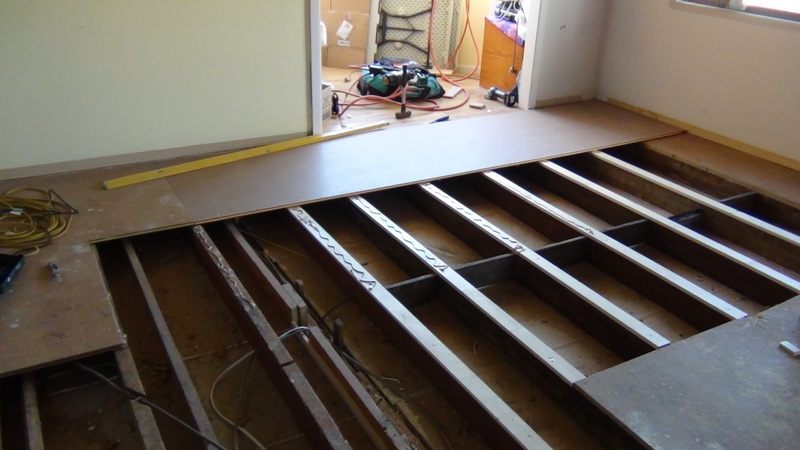 I decided that the easiest and cheapest fix was to pack the top of the joist and then lay the structural ply over the packing and existing sheeting. This was then liquid nailed and the ply was also battern screwed in some sections. 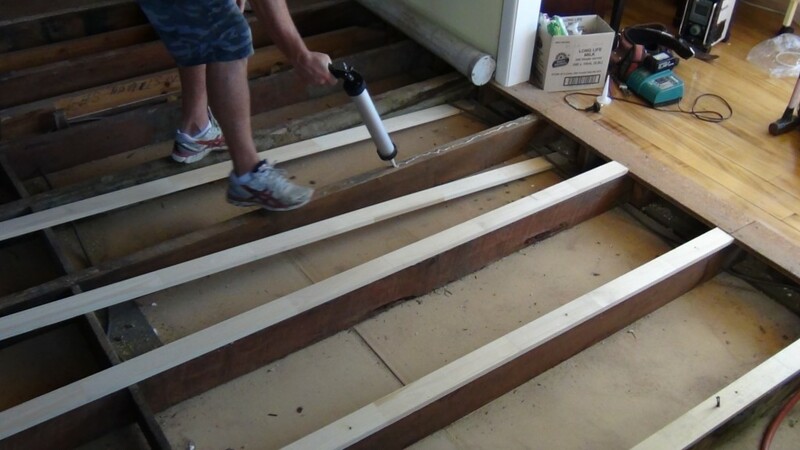 The existing skirting was reused and the levels looked right and the floor sounded right. Which was no squeaks.